The president of Moldova leads the ranking of the people's confidence among all Moldovan politicians, as is seen from a public opinion poll conducted by the International Republican Institute (IRI). 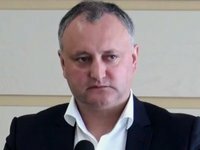 The poll findings made public in Chisinau on Friday show that 27% of Moldovan citizens trust Igor Dodon, 14% leader of the Dignity and Truth Platform Party (PPDA) Andrei Nastase, 13% Party of Action and Solidarity (PAS) leader Maia Sandu, 6% Prime Minister Pavel Filip and 6% Democratic Party leader Vlad Plahotniuc. As many as 4% each trust Party of Socialists Chair Zinaida Greceanii, Party of Communists leader Vladimir Voronin, and Ilan Shor, the leader of a party named by himself. As many as 3% trust Our Party leader Renato Usatii, and 2% each Gagauzia administration head Irina Vlah and parliamentary speaker Andrian Candu. At the same time, 27% of those polled said they do not trust any of the Moldovan politicians. On the other hand, ruling Democratic Party leader Vlad Plahotniuc has the highest anti-ranking: as many as 70% of the respondents have a negative and only 22% a positive attitude toward him. As many as 47% of those polled view President Dodon positively and 47% negatively; 40% view Andrei Nastase positively and 46% negatively. Maia Sandu is liked by 34% and disliked by 58% of the respondents. Almost half of Moldovan citizens support Dodon's performance as president, 14% disagree with some of his decisions, and 34% absolutely disagree with his position. Asked to assess the work done by the government led by Prime Minister Pavel Filip, only 7% said they are fully contented with its performance, 26% partially contented, and 37% are unsatisfied with it. Asked what the government should give priority to in its work, 35% mentioned salaries and pensions, 25% creating new jobs, 15% countering corruption, and 10% addressing the problem of emigration. Asked to assess the performance of the parliamentary majority led by the Democratic Party, 49% said they disagreed with the lawmakers' decisions, 17% partially disagreed, 21% partially agreed, and only 6% are fully satisfied with the lawmakers' work. Also, 46% of the respondents are of the view that the parliament is unreceptive to the people's needs, 32% that the lawmakers care about the people's problems only partially, and only 1% fully. Asked to say how they saw the work of local self-government bodies, 60% said they were satisfied with their work fully or partially and 35% said they were unsatisfied. As for Chisinau, only 22% of the city dwellers are satisfied with the work of the municipal administration, while 66% hold the opposite view. Moreover, 67% of Chisinau residents disagreed with the annulment of the mayoral election results. The public opinion poll of 1,503 respondents aged 18 and older was conducted on the entire territory of Moldova except for Transdniestria.